Many CSS3 attributes (e.g. border-radius) have long been implemented in various browsers with vendor prefixes, such as -moz and -webkit, which allow browser vendors to work on implementations of new features before the standard notation is set in stone. Remembering the different prefixes and the sometimes ridiculous variations in syntax for the attributes is a pain. Fortunately, Nettuts+ has made a nifty web utility that analyzes your CSS and adds in extra rules with the vendor prefixes. 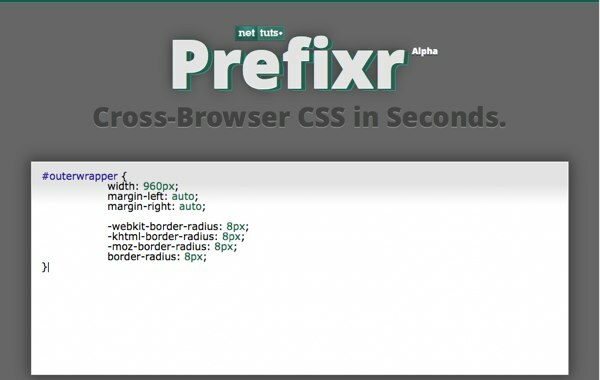 You just need to write your CSS with either the official attribute or one of the prefixed versions, and Prefixr will do the rest for you. If that wasn’t cool enough for you, it even has an API. You could use this to create your own tools that make use of Prefixr, or you could use it to integrate it with your favorite text editor. Examples are included for Textmate, Vim, Espresso, Alfred and Coda. And someone has already cooked up a Text Filter for BBEdit. That’s the killer feature for me. I can just hit a keystroke in BBEdit and the text updates a second later. I have made some comments on Twitter about there being a shortage of good tutorial blogs for iPhone app development. Envato has answered my wishes with a new Tuts+ site: Mobiletuts+. It launched on the 13th of May, with a nice long introductory tutorial on the iPhone SDK. It’s all about quality tutorials for mobile developers – all mobile developers, regardless of preferred platform. Topics will include native development with the iPhone, Android, Windows and Blackberry platforms, cross-platform development with tools like Titanium and Phone Gap, and techniques for building mobile web apps and mobile accessible web sites with HTML 5. Hopefully we’ll see some good content coming out of the new site in the future. Envato’s ThemeForest marketplace has added multi-project licensing for their products. Buy a 10 Project License for just 3 x the cost of a Single Use License. A 10 project license means you can use the same file over and over – up to ten times – without having to buy it again and again. They also offer a Web Service Licence, which costs 50x the cost of a Single Use License. 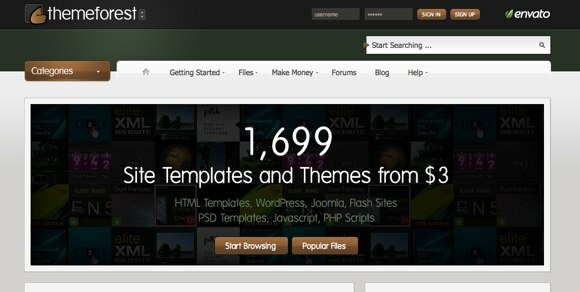 The license could be used on a site such as WordPress.com, if Automattic had the inclination to purchase a theme from ThemeForest. A site where the design might be in use by multiple clients, but hosted by yourself. There doesn’t seem to be a way to upgrade a license you already purchased, but you can simply buy another instance, as people have done in the past when they wanted to use a theme on another site. Collis Ta’eed, co-founder of Envato, is one of my favorite designers. His designs have a certain quality that you don’t see just anywhere. They’re simplistic, stylish, and unique. Envato, the ever-interesting network run by Collis and Cyan Ta’eed, has revamped their TUTS websites. NETTUTS, PSDTUTS, and their kin are now housed under the name of “Tuts+,” with a central website at Tutsplus.com. They’re the same sites, but more tightly-knit. Today across the Tuts+ network we’re rolling out some changes to our brand and how our sites work together. 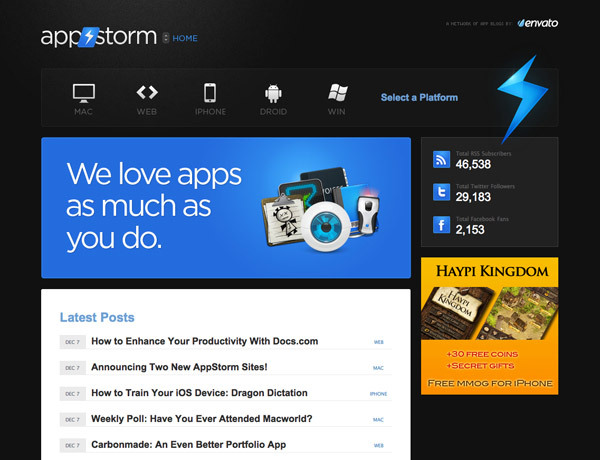 These changes include a rebrand of our logos, a shift from multiple domain names to a single top level domain, a universal Plus membership, a Plus Affiliate Program, updated Plus interface, a Twitter Tuts+ news stream and a new tutsplus.com site complete with a rearrangeable dashboard. In other words, a whole bunch of stuff! You can read the full announcement here, with all of the big changes they’ve been making. The new logos and naming scheme don’t seem quite right. Net.tuts+ just seems kind of awkward. It doesn’t read as well as NETTUTS. I’ve always wondered whether I should say “Net tutts” or “Net toots,” but now I have to say “Net tutts plus,” and write it with that awkward period and plus sign. The move to subdomains of tutsplus.com seems silly. You have the domains, they’re well established, they’re easier to type why change them? They may still get you there, but you’re jsut dilluting your existing brand. There’s already Tuts+ and Envato branding plastered all over the TUTS (sorry, “Tuts+”) sites. I can see not wanting to drop thousands of dollars for new *tuts.com domains, but it seems silly to change the other ones as well. I think it would be better to make the subdomains be the secondary, redirect URL for the sites that have their own domains. I can understand the changes, but those two just don’t sit well with me… I suppose I will get used to them in time.